Further the woodland look in your bird garden using the Whitehall Oak Leaf Large Tube Bird Feeder. Acorn shapes in relief grace each facet on this 9.5" square roof, surrounded by slightly raised oak leaf shapes for added dimension. An 8.25" diameter base tray has a hammered finish for added texture, and the dark bronze coloring throughout the roof and base furthers the natural look. Lighter bronze hints on the recessed portions help define the artwork, and allow the item to dazzle in sunlight. A clear plastic seed tube connects the roof and base, and holds up to 2.25 quarts of seed. 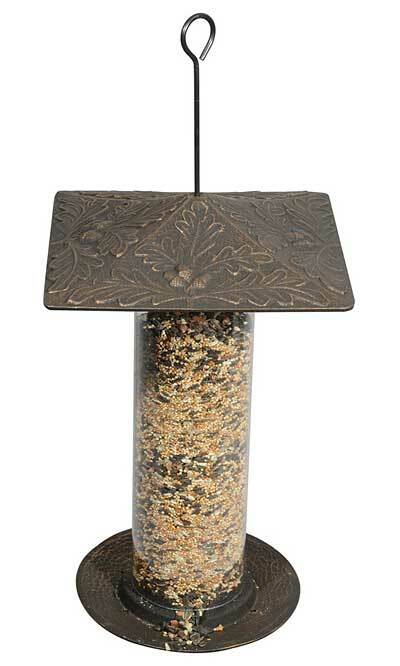 Use mixed seed to attract a variety of birds to your sanctuary, or use safflower seed or peanut splits for more specific bird feeding. Three depressions on the base tray allow seed to exit onto it, for birds to dine and perch easily. Drainage holes on this base enable captured water to escape, for dry and fresh seed. Both the roof and base are crafted from sturdy aluminum, for a rust proof and lasting feeder, and a metal rod through the item adds stability. Lift the roof up this rod to fill the reservoir, and use its loop to hang the unit from a hook or bracket. Showcase trees in your yard with this Oak Leaf Large Tube Bird Feeder. Made in the USA. Capacity: 2.25 qts., 3.375 lbs.